Not too long ago it was Mother’s Day and I was listening to a testimony made by a father of four young children regarding his wife, and he ended it off with this verse. I was suitably moved. Now I’m neither a mother nor a wife, but I do have a mother, and I was fortunate enough to have grown up in a church whereby there were plenty of opportunities for me to observe the many wives and mothers of godly character in their daily lives. While much of the book of Proverbs has been credited to the authorship of King Solomon, Chapter 31, amongst others, have long been in dispute – chapter 31 credits itself to King Lemuel. Regardless, Proverbs 31:10-31 is an amazing acrostic poem – the verses of which begin with the successive letters of the Hebrew alphabet. This perhaps is one of few passages in the Bible in which the standard of a virtuous and godly woman was placed. And don’t ignore it just because it came from the Old Testament – every part of it can still apply to us today. In this study, we will use real examples from the Bible to examine the validity of the idea that a wife of noble character is worth far more than rubies. You may be surprised that I chose to highlight Sarah (or Sarai). I’m sure if we were doing a poll on the most outstanding women in the Bible, she probably wouldn’t be in many people’s top ten list. The likes of Ruth, Esther, Mary would likelier make the mark. Yet while those women were extremely outstanding in their own right, we’re looking at wives today, and it is for her excellence in her role as a wife to the patriarch of Israel that I wanted to highlight her. We may not remember her much beyond her laughing in disbelief when told that she would bear a child, or her trying to take matters into her own hands and giving Hagar to her husband, but she is perhaps unique in her role as the supportive and submissive wife of a major character in the Bible. 1 Peter 3:1-7 is yet another list of the virtues of a godly wife, and in this passage an example was made out of Sarah – For this is the way the holy women of the past who put their hope in God used to adorn themselves. They submitted themselves to their own husbands, like Sarah, who obeyed Abraham and called him her lord. You are her daughters if you do what is right and do not give way to fear [1 Peter 3:5-7]. Despite the two incidences – her disbelief that she would bear a child in her later years, and her role in Hagar’s bearing a child for her husband, what we do not dwell on is perhaps a lifetime of submission and support to a man with heavy responsibilities and strong sense of loyalty. Surely it wasn’t easy when Abraham gave Lot the choice of the better land. Surely it wasn’t easy to look on and hold on as Abraham went to rescue Lot. Surely it wouldn’t have been easy to know that Abraham had almost offered Isaac as a sacrifice – if she did know about it, whether before or after it happened. And perhaps the greatest act of submission can be seen when Abraham asked her to say that they are siblings. It happened twice, and she was taken into the harem twice. That is, for the lack of a better word, crazy. The plot of a woman being barren till her old age is not new by the time the New Testament came, but in the birth of John the baptist we see the opposite of what happened to Sarah and Abraham – while Abraham believed and Sarah did not, Elizabeth believed while Zechariah did not. Zechariah was struck dumb for his disbelief, but Elizabeth didn’t seem to have trouble believing – in fact, when Mary came to visit her, she didn’t need any introduction to know that she was to be the mother of the Lord. Any ordinary person with lesser faith would have been abhorred at Mary, but not Elizabeth. Her son John the Baptist was an important forebringer of the gospel, he paved the way for Christ to walk, and Jesus had reserved high praise for him – Truly I tell you, among those born of women there has not risen anyone greater than John the Baptist [Mt 11:11]. Sometimes I wonder if Elizabeth would have been chosen if her faith was any lesser. Yet because of her faith, Zechariah was blessed as well. 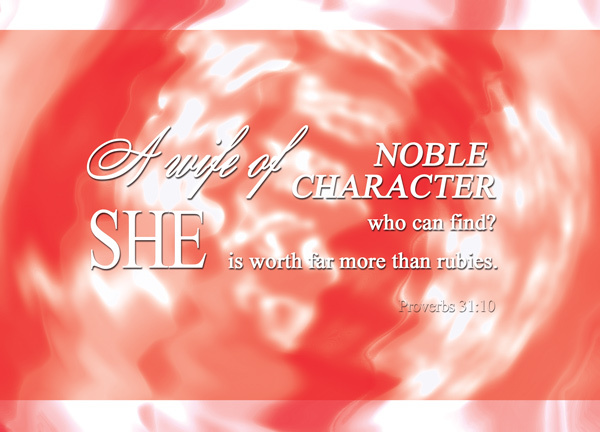 Truly, a wife of noble character is worth more than rubies. In today’s less patriarchal society women play a larger and more active role alongside their husbands as compared to women like Sarah, whom stayed silently in the background. Priscilla and Aquila were perhaps one of the first examples of husband and wife working along side-by-side for the kingdom of God. They were tentmakers like Paul – and while that must have meant that they were in some kind of business related to tents, today the term tentmaking really refers to people who serve full-time in the kingdom of God in some kind of missionary or ministerial role but receive little or no pay, instead performing other jobs in order to support themselves. It must be noted that whenever Priscilla and Aquila were mentioned, it was always Priscilla first, then Aquila [Acts 18:18,19,26; Rom 16:3]. It was always Priscilla and Aquila, which really makes me wonder if Priscilla was the more active one, but we’ll probably never know. They were great friends with Paul, accompanied him on his mission trip to Syria (though they stopped at Ephesus), mentored Apollos, and risked their lives for Paul – my co-workers in Christ Jesus. They risked their lives for me. Not only I but all the churches of the Gentiles are grateful to them [Rom 16:3-4]. There are many, many more wives in the Bible who were of noble character. Queen Esther, for one, saved her people. Ruth honored her dead husband by refusing to forsake her mother-in-law Naomi. I’m sure there are many more. And while we’re on this topic, not that we’re playing the blaming game, but just for the sake of contrast, there were also many wives whose characters may have been lacking, and they did not become a blessing to their husbands. Women like Lot’s wife, or Job’s wife; women like Gomer, wife of Hosea. Or Saphira, who though not any worse than her husband, was equally sinful. Or maybe we should go back to the beginning and think about Eve. Indeed, a wife of noble character is not easy to find. And once found, surely she is worth far more than rubies.